What Can We Learn from the Ending Sentence or Thought in Each Book of the Bible? As a writer I know the two most important things of anything I write are the beginning and the ending. A strong opening draws readers and keeps them interested, while a powerful close gives readers something to take with them. Though I don’t think biblical writers focused on these two areas, it’s still interesting to look at how they wrapped up their writings. Here’s a list of the last sentence or thought from each of the twenty-seven books of the New Testament. Matthew ends by quoting Jesus, which many embrace as a personal call to action. “Then Jesus came to them and said, ‘All authority in heaven and on earth has been given to me. Therefore go and make disciples of all nations, baptizing them in the name of the Father and of the Son and of the Holy Spirit, and teaching them to obey everything I have commanded you. And surely I am with you always, to the very end of the age’ ” (Matthew 28:18-20, NIV). Mark has two endings, with the second one not found in all manuscripts. But since the first version ends abruptly and leaves us hanging. I’ll share the concluding thought in the second one. “After the Lord Jesus had spoken to them, he was taken up into heaven and he sat at the right hand of God. Then the disciples went out and preached everywhere, and the Lord worked with them and confirmed his word by the signs that accompanied it” (Mark 16:19-20, NIV). Luke ends his biography of Jesus by telling us what his followers did. This contrasts to what Jesus told his followers to do at the end of Matthew. “When he had led them out to the vicinity of Bethany, he lifted up his hands and blessed them. While he was blessing them, he left them and was taken up into heaven. Then they worshiped him and returned to Jerusalem with great joy. And they stayed continually at the temple, praising God” (Luke 24:50-53, NIV). As a writer I especially appreciate the end of the book of John, but from a broader perspective it makes me wish more people had written about the life of Jesus. I want to know more. Luke concludes the book of Acts with what may be Paul’s last work here on earth. This should encourage us to finish strong. “For two whole years Paul stayed there in his own rented house and welcomed all who came to see him. He proclaimed the kingdom of God and taught about the Lord Jesus Christ—with all boldness and without hindrance” (Acts 28:30-31, NIV). Paul ends most of his letters succinctly and often with a bit of encouragement. A reoccurring word in many of his parting lines is grace. “…to the only wise God be glory forever through Jesus Christ! Amen (Romans 16:27, NIV). “My love to all of you in Christ Jesus. Amen” (1 Corinthians 16:24, NIV). “May the grace of the Lord Jesus Christ, and the love of God, and the fellowship of the Holy Spirit be with you all” (2 Corinthians 13:14, NIV). “The grace of our Lord Jesus Christ be with your spirit, brothers and sisters. Amen” (Galatians 6:18, NIV). “Grace to all who love our Lord Jesus Christ with an undying love” (Ephesians 6:24, NIV). “The grace of the Lord Jesus Christ be with your spirit. Amen” (Philippians 4:23, NIV). “I, Paul, write this greeting in my own hand. Remember my chains. Grace be with you” (Colossians 4:18, NIV). “The grace of our Lord Jesus Christ be with you” (1 Thessalonians 5:28, NIV). “The grace of our Lord Jesus Christ be with you all” (2 Thessalonians 3:18, NIV). “Grace be with you all” (1 Timothy 6:21b, NIV). “The Lord be with your spirit. Grace be with you all” (2 Timothy 4:22, NIV). “Grace be with you all” (Titus 3:15b, NIV). “The grace of the Lord Jesus Christ be with your spirit” (Philemon 1:25, NIV). Though we don’t know who wrote Hebrews, it’s interesting to see a similarity to Paul’s sign offs. “Grace be with you all” (Hebrews 13:25, NIV). Noted for his direct, practical writing, James ends his book the same way. “Remember this: Whoever turns a sinner from the error of their way will save them from death and cover over a multitude of sins” (James 5:20, NIV). The ending to Peter’s two letters are much different than Paul’s. “Greet one another with a kiss of love. Peace to all of you who are in Christ” (Peter 5:14, NIV). “So then, dear friends, since you are looking forward to this, make every effort to be found spotless, blameless and at peace with him” (2 Peter 3:14, NIV). There seems to be no similarity in how John concludes his three letters. “Dear children, keep yourselves from idols” (1 John 5:21, NIV). “The children of your sister, who is chosen by God, send their greetings” (2 John 1:13, NIV). “I hope to see you soon, and we will talk face to face. Peace to you. The friends here send their greetings. Greet the friends there by name” (3 John 1:14, NIV). Over the years, I’ve heard many church services end by quoting these two verses. “To him who is able to keep you from stumbling and to present you before his glorious presence without fault and with great joy—to the only God our Savior be glory, majesty, power and authority, through Jesus Christ our Lord, before all ages, now and forevermore! Amen” (Jude 1:24-25, NIV). And last, we have the final words of the Bible. 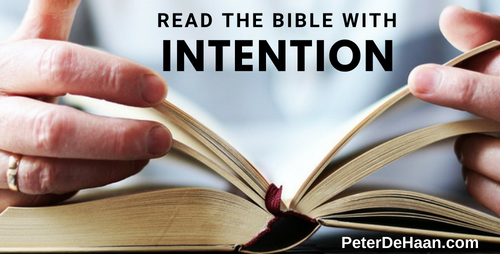 When we read the Bible and get to the end of a book, what do we do? Do we read fast and quickly close our Bible, glad to have finished another book, or do we let the ending sit with us a while as we contemplate its words?